Over this summer we have had a number of requests for assistance from property owners whose mainly pierce-fixed roofs have leaked following hailstorms where fine hail has accumulated on the roof up to a depth of 40/50mm. On the Highveld this type of storm is not uncommon over a period of ten years or so. The root cause of the leaks is that the hail reduces the water carrying capacity of the cladding thereby causing a buildup of water at the interface between the melting hail and cladding which results in the development of a capillary siphon at the side-laps between adjacent sheets. The flatter the roof the more prevalent the leaks. A roof inclined at 10° has a drainage capacity 36% greater than one inclined at 5°. 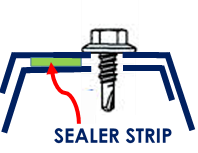 The solution is to insert a butyl based sealer strip, preferably one with a reinforcing string, on the weather side of the fasteners along the entire length of the lap joint. In order to ensure the development of a continuous weatherproof seal we recommend that stitching screws be installed, at no more than 600 mm centres, between the fasteners anchoring the cladding to the supporting structure. An area often overlooked is the top section of a curved roof which is effectively flat. The larger the radius the greater the extent of the “flat” section. It is strongly recommended, as an absolute minimum, that a sealer strip be fitted in the side-laps from the crest to the point where the slope of the cladding is equal to the minimum slope for the respective profiles.